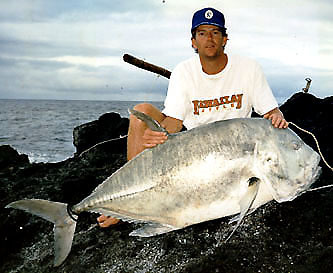 Doug used a special technique called hang baiting to catch his monster ulua. He suspended a bait at the ocean's surface by using a long bamboo pole to hold it away from the cliff's edge. After the strike, Doug fought his rampaging trevally with a 5-foot 6-inch Fenwick pole, Penn 9/0 Senator reel and 130-lb test Ande line.